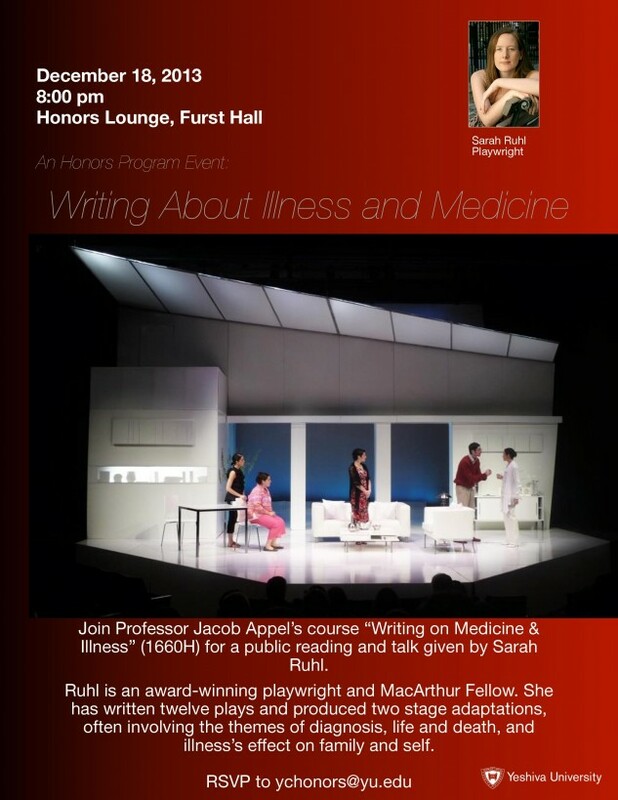 Please join the Honors Program and Professor Jacob Appel’s course “Writing on Medicine & Illness” (1660H) for a public reading and talk given by Sarah Ruhl. Sarah Ruhl is an award-winning playwright and MacArthur Fellow. She has written twelve plays and produced two stage adaptations, often involving the themes of diagnosis, life and death, and illness’s eﬀect on family and self. The talk will take place December 18th in the Honors Lounge, in Furst Hall, at 8 PM. Come hear a fascinating talk about the interplay between literature and medicine. This talk will continue our theme of the semester of how science and the humanities interact with each other.